Kristen Kent, MD, FAAEM is a board-certified emergency physician who works locum tenens. She received a B.S. in Exercise Science and M.D. from the University of Iowa. She graduated from the Emergency Medicine Residency Program at the University of Massachusetts and trained in medical toxicology for an additional year after residency. Over the past ten years, Dr. Kent has worked in various emergency departments from small hospitals in rural areas to urban level-one trauma centers, as well as working in flight medicine and telemedicine. 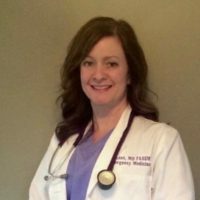 She is an active member of the American Medical Association (AMA) and the American Academy of Emergency Medicine (AAEM), and she is an instructor for courses through AAEM. Her publications and conference presentations are in the areas of emergency medicine, psychology, and toxicology. For over twenty years, she has volunteered to care for underserved medical populations both in the United States and abroad.